Forever Scotland IT Consutancy are Stock Control Software experts incuding Microsoft Dynamics Retail Management System stock control software. 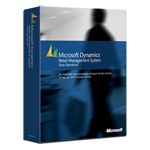 Microsoft Dynamics RMS is designed to help retailers respond rapidly to consumer demands, ensure efficient replenishment, and build cost-effective relationships across the entire supply chain. Microsoft Dynamics RMS can work with your existing computers or Forver Scotland can supply a complete EPOS Till system if required. Still not sure if Microsoft Dynamics RMS is for you? Why not Contact Forever Scotland and see how Microsoft Dynamics RMS could streamline your business?